Rates may not apply to certain peak periods/public holidays or long weekend within date sets. One of the first lodges to feature ground breaking styling (West African influences here) saw it voted “most innovatively designed hotel in the world”! 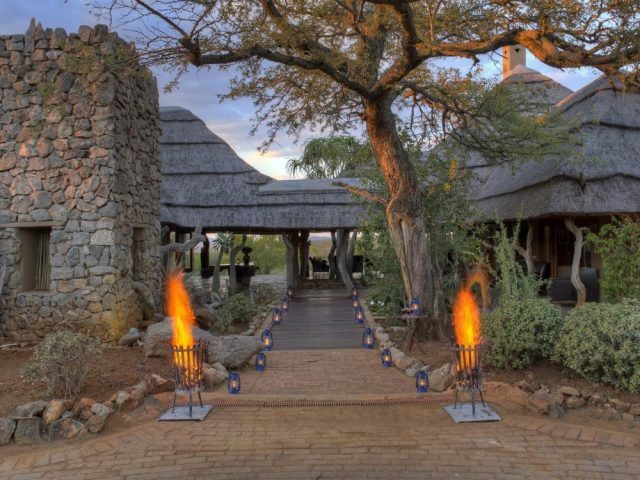 Makalali still boasts some of the most innovative and spectacular architecture of any lodge in the country! 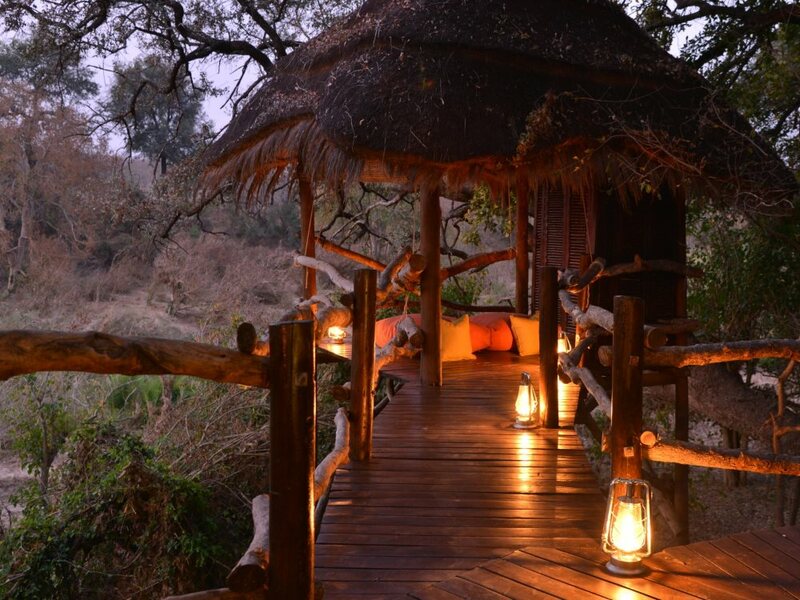 The highlight for us has to be the gorgeous salas under the trees perched over the riverbed – the perfect place to relax with a book and watch the bushbuck and nyala that roam around the lodge from the comfort of the day-bed! The use of the earth walls and pigmented screed floors can make the rooms pretty dark inside and quite chilly during the winter months – good thing then that you have a fireplace in your room! Makalali is truly a unique experience. It is actually made up of 4 small camps, each consisting of 6 individually designed suites, which lie spaced a short distance apart along the shady banks of the Makhutswi River. 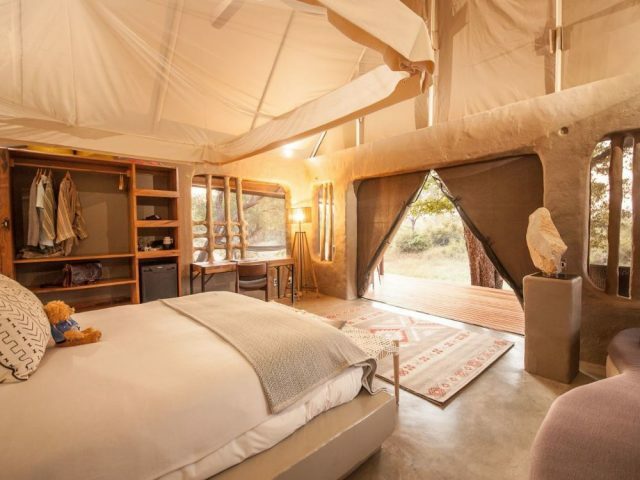 The innovative design for the 4 camps - namely Tandane, Mkhiwa, Eptomeni and Phiva - were all created by the world renowned architect Sylvio Rech and to all intents and purposes are extremely similar so there is no need to try to specify a specific lodge as the experience will be basically identical. What it does mean is that wherever you stay you’re assured of an intimate and personal camp, each with their own stand-alone restaurants and swimming pools. 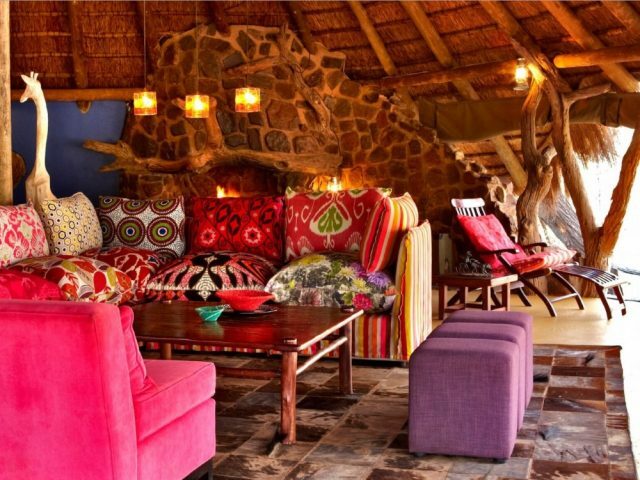 The objective when building Makalali was to create something completely different from the traditional old fashioned game lodges found all over South Africa – and boy, did Sylvio Rech deliver and how! He envisaged a lodge built under the giant trees that guard the river that would completely break with the norm and he managed this through incorporating exotic styling influences, colours and materials.There are elements of the classic buildings of Timbuktu and pure tribal fantasy too with spectacular thatched spires, earth walls and the extensive use of pigmented cement screeds, stones inserted into imposing cement pillars, not to mention stunning hand-tooled wrought metal artworks! The local craftsman employed to bring Sylvio's design to life were eager to work with him as they loved Sylvio’s ideas and his vibrant energy! In the interest of sustainability large quantities of rock found on-site were used during the construction of the lodges. When it was first opened Sylvio's creation caused an absolute sensation with a huge amount of coverage in the world’s top design and travel magazines – in fact the prestigious Tatler magazine voted Makalali as “the most innovatively designed hotel in the world!” In fact, with the throwing away of the old styling rule book that took place here, it’s no exaggeration to say that the launch of Makalali was the catalyst to the creative design revolution that the game lodge industry has undergone in the last decade or so. As mentioned all of the 4 mini-camps are private yet within easy access to one another - each camp offers a uniquely designed small swimming pool, open air boma and an enclosed dining and lounge area.All suites boast en-suite bathrooms with an outdoor shower, a romantic fireplace to curl up in front of on those chilly winter evenings, as well as a raised private timber viewing deck or sala which is set amongst the Jackalberry trees that line the riverbed. When we stayed at Makalali this was where we spent most of our time slouched on the day-bed of our sala reading (followed shortly by dozing!) looking up every now and again to perhaps catch sight of a shy bushbuck or kudu warily tip-toeing through the gorgeous riverine forest! Rooms are individually decorated in African design style with sculptured metalwork lamp shades, taps and ceramic basins – Victorian style baths (with tea-light candles) are also found in all the rooms for a good old romantic soak! Like so many of the lowveld reserves, Makalali, which means “place of rest”, was an old cattle farm before becoming a wildlife conservancy back in the early 90’s when a major game re-introduction was carried out including such icon species as lion, cheetah, leopard, elephant, and rhino and more lately disease-free buffalo have also been released. Since those early days the game numbers have increased dramatically and the 22 000 hectares of lowveld Acacia bush and open savannah grass land now boasts very good game viewing. Unlike the pretty flat countryside in the reserves along Kruger’s direct borders, Makalali's bushveld is rather more undulating with some elevated viewpoints giving panoramic views of the reserve. The lodge is ideal for family safari holidays as the children can enjoy a range of activities tailored especially for their needs – there are baby sitters available or the little ones can enjoy mini-ranger programmes which will keep them entertained for hours on end! This then gives you the chance to go on the daily two scheduled game drives with experienced rangers and trackers who will entertain you with their knowledge and you can sit back and enjoy seeing the wild animals in their natural habitat. 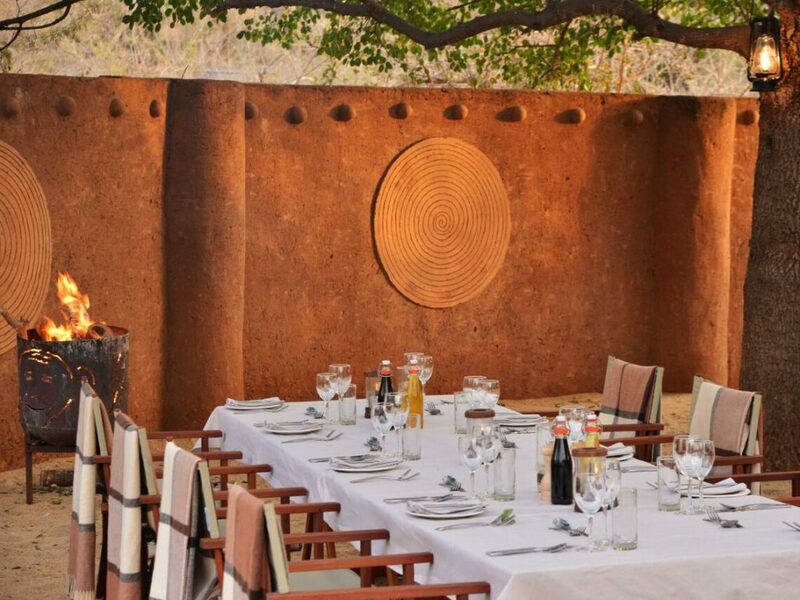 Perhaps you’ll get to enjoy dinner in the bush or the legendary ‘boma dinner’ under the stars – there’s also the indoor-outdoor dining area where you can enjoy a plated dinner or more casual family style dining with other guests. Our favourite though has to be the very romantic private ‘sala’ dinner – the perfect way to end off a day to remember with your better half!